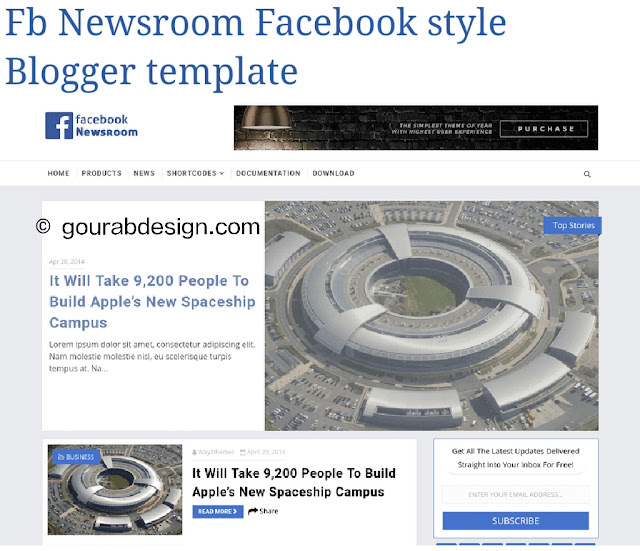 Fb Newsroom - Blogger Template For Facebook Style is ideal for those who want to publish new trends on their website. If you have a website or blog where you share news content every day So this topic is definitely one of the best choices for your blog. The Blogger Model FB Newsroom not only comes with a responsive design. But it has many advanced features and other bonuses can not be found in other free blogger templates. One of the biggest features is attractive for many people's designs. If you see the preview version, you can see it. It has a beautiful blue design that looks like facebook design. So, if you share the news and share. most of your loyal readers who are from prefer browsing your website. As it has a Facebook-like design, it will improve the user experience of your wbsite. Best choice to your blog.There is a good scroll bar that you can use to display your most popular posts on the homepage. You can also get lots of customers using the good box of the client widget. It's also a ready, so you do not have to worry about it. All you need is some quality traffic on your website and you can easily start earning money with your unique content. Seo ready . This is a mobile friendly, Optimizes model. That is designed and prepared for all types of bloggers / magazines. Versatile, easy-to-use , whether you're new, are packed with highly customizable, functional, and feature-rich features, with many easy-to-install content management widgets. Create all types of blogs with any type of cookie pages, travel for parents / moms, health, fitness, gym, personal,fashion of yoga. , Pet . Mag Cars, Mag Games, Tech Force and more. is the perfect blog topic for your success.